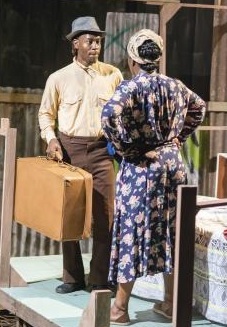 BROTHER MAN: Actors Jason Richards (right) and Neile Waithe sharing a scene from the production. FEW Caribbean plays generate excitement as feverish as Moon on a Rainbow Shawl, Errol John’s classic work about class, ambition, domestic strife and broken hearts that gets a hot revival this month at the Edna Manley College’s School of Drama. 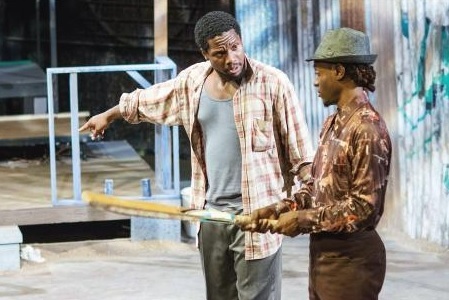 It’s easily one of the best productions you’ll see on the Jamaican stage this year. Directed by Eugene Williams, the play crackles with a vibrant energy and commanding performances from a bunch of competent student actors and guest performers who bring John’s vision to rousing life. It’s a fantastic blend of detailed, elaborate set design, apt lighting and period-appropriate costumes – all brought together into a compelling whole, thanks to Williams’ masterful direction. Set in the backstreets of Port-of-Spain, Trinidad, circa the Second World War, Moon on a Rainbow Shawl takes us into a cantankerous tenement yard, where we are introduced to characters as well-drawn as they are colourful, people living amidst the stench of poverty and the everyday struggles to make ends meet. There’s Sophia Adams (the excellent Fredreeka Smith), a hardened matriarch who can read you like a book, grappling with a naïve young daughter (Marchinel Smith as Esther) and a deadbeat husband named Charlie (Neil Waithe), an ex-cricketer who likes his rum to the point of drunkenness. Then there’s Ephraim (Jason Richards, superb), the ambitious security officer who is on the cusp of a promotion to Inspector but wants nothing more than to leave Trinidad for a new (and better) life in England. That’s why he cannot afford to be weighed down by the likes of Rosa (Alandrea Reynolds), the sweetheart he’s been sharing his bed with who suddenly reveals her pregnancy upon hearing of his departure plans. Mavis (Jaycie Lewis), meanwhile, is the resident flirt who regularly takes home drunken sailors, much to the chagrin of Prince (Nicholas Amore), her feckless common-law companion who eventually puts a ring on it. Lording it over them all with geriatric finesse is landlord Old Mack (Chevan Shirley). When Old Mack’s shop gets broken into, the crime and ensuing investigation lead to a series of events that spark a fierce reckoning with the past, while bringing into sharp focus the dire socio-economic hardships these people face but also that universal mix of actions and life-altering consequences.